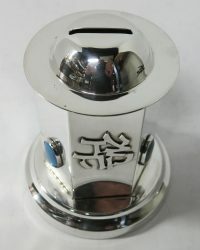 Sterling Silver Tzedakah Box / Charity Box, Hand Made In Israel By Bier Silversmiths. Six Sided Body With Applied Hebrew Lettering On Front Panel. The Rear Panel Is Blank, And The Other 4 Panels With Colored Stones. 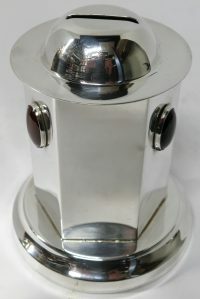 The Base Is Round, As Is The Detachable Domed Lid. Very Good, Barely Used Condition. No Inscriptions Or Initials. 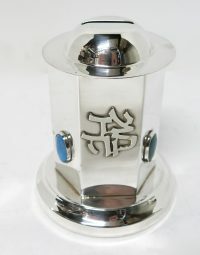 Base Is 4.5″ Diameter. Height Is 5.5″. ABOUT BIER SILVERSMITHS: The workshop was founded in Jerusalem by the father of the family Yitzchak Bier over 50 years ago. Yitzchak Bier graduated the Bezalel Academy of Art and in establishing the workshop was also establishing a new concept in Judaica Art. There were almost no Jewish silversmiths after the holocaust and there was a need to fill the demand for silver religious items at that time. 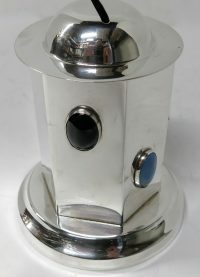 Yitzchak Bier won a special prize for an extraordinary Chanukah Menorah which he designed. Thus was launched Bier Enterprises. Most Bier designs are original designs of Yitzchak Bier and always taken into account are beauty of form and comfort of use. While over the years many new lines and designs have come to be part of Bier’s repertoire many of the older classic designs remain bestsellers to this day. His sons Mordechai and Meir followed in their father’s footsteps and together ensure excellence and craftsmanship. 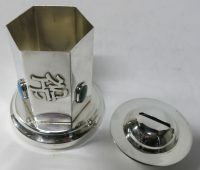 Everything at Bier Judaica is handmade using different silversmithing techniques: metal cutting, bending, metal spinning, lost wax casting, hammering. 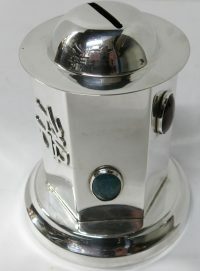 The silversmith can create almost every design that is imaginable using these techniques, materials and his knowledge and skills. Bier classic designs make use of bible verses, original decorative lettering and ornaments related to Jewish customs and folklore. Most if not all items are antique or used items, and as such nothing is ‘perfect’, but we always will describe any damage, repair, inscriptions, monograms etc to the best of our ability. Please ask any questions BEFORE purchasing any item. All weights & measurements are approximate, but as accurate as possible. Please view all the pictures as they form part of the description. All items are available to inspect, and pick up, at our Manhattan gallery. We do not ship to PO Boxes. We use Fedex Ground shipping, and a signature is required for delivery. Don’t forget we offer free ground shipping anywhere on mainland USA. We ship worldwide. Please contact us for a shipping quote.